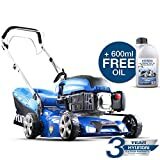 The most essential piece of lawn maintenance hardware that you will own, your lawn mower carries a great deal of importance. It will keep your yard clean, healthy, and aesthetically pleasing, as you take care of nasty weeds and unkempt grass. Barbeques will taste better, games of catch will be more fun, even your dog will notice a difference. To help you find the lawn mower that will transform your yard, we’ve put together this handy buying guide. When it comes to buying a lawn mower, you’re going to have some options. Gas or electric? Corded or cordless? Push, riding, or robotic? All of these choices have benefits one way or another; here’s a breakdown of the types of lawn mowers to help make your decision easier. 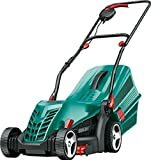 Gas mower: While these models offer greater power and distance range than their electric counterpart, they require periodic maintenance (such as oil changes) and they create small amounts of pollution from engine combustion. 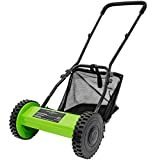 Electric mower (corded, cordless): Though they are relatively quieter than gas mowers, electric mowers come with their own downsides. Corded models are limited in range and their power cord can get in the way, causing potentially deadly problems. Cordless mowers, meanwhile, have great maneuverability and environmental friendliness, but tend to be more expensive and less powerful than their gas-powered alternative. Hover mower: Often used by commercial landscapers, hover mowers are powered rotary push lawn mowers that use an impeller to drive air downward and lift the mower up above the ground. While these are light and easy to move, they don’t work the best on your typical grassy areas. 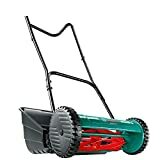 Special mulching blades are also available that are designed to keep clippings circulating underneath the mower, creating compost for the lawn and reducing waste. Robotic mower: Imagine a Roomba, but for your lawn. Robotic mowers are contained by a wire around the lawn that defines the border area, and can mow up to five acres of grass. Most models are able to dock themselves and contain rain sensors, eliminating most needs for human interaction. Riding mower: Popular for larger lawns, riding mowers feature a seat and controls on the mower, so you can ride the machine. They feature different types of transmissions, including manual, hydrostatic, and least commonly, electric. These mowers offer some of the most utility as they can mount other devices as well, such as plows or vacuums. Weight: Customers were pleased with lawn mowers that were lightweight and easy to maneuver. While some mowers will obviously be heavier than others, their weight should never get in the way of their mobility. 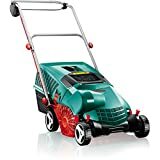 Easy to start: As one purchaser noted, “there is nothing more aggravating than a lawn mower that won’t start.” It’s imperative to find a lawn mower that will start easily and without issue right out of the box, and it’s even more important that it will continue to work without hassle as you use it. Maintenance: As a piece of heavy machinery, lawn mowers will require routine maintenance in order for it to continue running smoothly. You’ll want to find a lawn mower that will stay in running shape and won’t need upkeep too often. Consider the size of your lawn. If you have acres and acres of grass to maintain, you will probably be better off with a riding mower. But if you are just dealing with a small yard, a push mower—whether gas- or electric-powered—should do the trick. Keep the type of terrain you're cutting in mind as well. While you really shouldn’t be using a lawn mower on land that is on more than a 15-degree angle, if your lawn does have a lot of slopes it might not be the best idea to be lugging a massive mower up and down the yard. You should also take into account what you’re planning to do with the cut grass. Whether you want to bag your clippings, turn it into mulch by chopping the cut blades of grass into tiny bits that fall to the ground and nourish the lawn, or simply want the clippings blown out of the side of the mower, you should find a lawn mower that fits your needs. GreenWorks: Greenworks is leading the way in innovation and is changing how consumers maintain their lawns by eliminating the frustrations that are found with traditional gas-powered equipment. Its products are solely electric and have a zero carbon emission. Lawn-Boy: The original Lawn-Boy lawn mower was manufactured by the Evinrude Company in 1934, becoming the first one-handed reel power mower introduced to the American public. Today, Lawn-Boy creates reliable mowers that are simple and budget-friendly, building on the quality and craftsmanship that made it so popular in the first place. Black & Decker: In 1917 Black & Decker opened its first factory in Towson, Maryland, where it is still headquartered to this day. Since those earliest days it has remained focused on customer needs as it manufactures power tools, accessories, hardware, and home improvement products.